Treasury Secretary Steve Mnuchin informed Congress this week that his department would cease its investment in two federal retirement programs as part of its extraordinary measures intended to delay running into the debt ceiling. On Saturday, the federal government hit its borrowing limit, and last week Mnuchin informed Congress that he would be suspending the department’s issuance of State and Local Government Series securities. 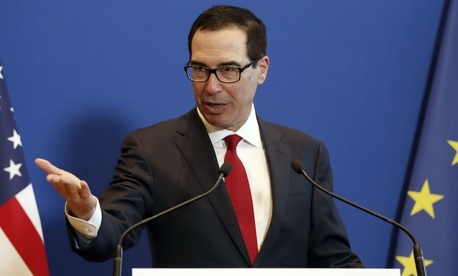 Mnuchin followed up Monday, sending Congress a letter informing lawmakers that he would suspend investments in the Civil Service Retirement and Disability Fund, as well as the Postal Service Retiree Health Benefits Fund. And on Tuesday, the Treasury secretary informed House Speaker Nancy Pelosi that he would suspend investment in the Thrift Savings Plan’s G Fund, which is made up of government securities, to avoid breaching the debt ceiling. With these actions, and an influx in revenues when federal income taxes are due in April, officials believe the Treasury Department can continue to fund government operations “for several months” before Congress will need to act to raise the debt limit again. Lawmakers hope to do so when they pass appropriations bills to set spending for the 2020 fiscal year this fall. Federal employees should not worry too much about their retirement savings, though. Mnuchin told Congress that once the debt limit is raised, his department will make these investment funds whole once again. Elsewhere on Capitol Hill, some lawmakers plan to introduce legislation to make the federal government’s defined benefit retirement programs more generous. Rep. John Garamendi, D-Calif., sent a “Dear Colleague” letter to lawmakers asking them to cosponsor the CPI-E Act, a bill that would base Civil Service Retirement System and Federal Employees Retirement System cost of living adjustments on the Consumer Price Index for the Elderly, rather than the currently used CPI for Urban Wage Earners and Clerical Workers. When introduced, the bill will have dozens of cosponsors, including members of both parties. Garamendi introduced similar legislation in 2017, although it never emerged from committee. The Office of Personnel Management reported Tuesday that the volume of federal employees retiring in January and February, when the agency experiences an annual surge, was down compared to 2018. In January, 13,264 employees filed for retirement, and last month 10,792 employees applied. That’s down from last year, when 14,590 employees requested their retirement benefits in January, followed by 13,290 in February. The 35-day partial government shutdown could account for some of the drop in retirement requests, as unfunded agencies furloughed HR employees, making it impossible for some to retire if they had not announced their intent before the lapse in appropriations began last December. Over the two-month period, OPM processed 18,705 retirement claims, in line with the same period in 2018. Although the retirement backlog spiked from 18,019 claims in December 2018 to 23,121 in January, OPM was able to maintain that figure last month, as it only increased slightly to 23,370.